Another exploratory trip to the Trent yesterday. Had a look at a couple of stretches, but didn't find a swim I really, really fancied - although I have lined some up for when the river is in flood. Saw two other anglers, but there were plenty of others out fishing. Walking along one shallow length I spooked a pair of egrets from a sandbank, later seeing a kingfsher and a mink in a wooded stretch, herons were everywhere. Then at dusk, after I had settled into a swim that was deepish close in, I noticed something moving along the far bank margins. From the sound being made I thought it was a couple of duck I'd seen earlier, but when I got the binoculars trained on it I saw an otter. The first one I have seen in England. 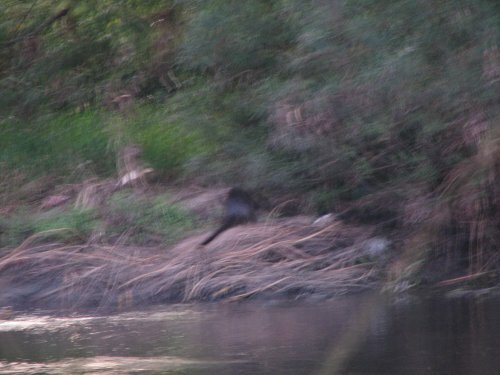 I managed to grab a quick snap, but the shutter delay meant the animal had moved by the time the photo was taken, and the low light made for a lot of camera shake. You can just about tell what it is in the 'Sasquatch' type photo! I started getting chub knocks as the light faded, all on the downstream rod fishing shallower water near a willow, but nothing positive. Then after dark I saw a shooting star - always a good omen. It was then I got a chub rattle that didn't stop, and a small fish was being wound in. Then it fell off!